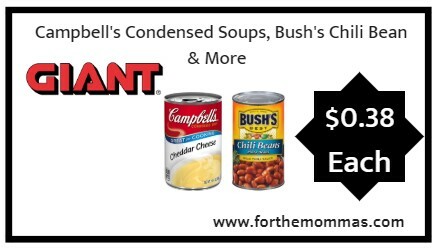 Giant: Campbell’s Condensed Soups, Bush’s Chili Bean & More ONLY $0.38 Each Starting 10/12! Starting from 10/12, Giant has a sale including multiple products for just $1.00 each. You can find Campbell’s Condensed Soups and Bush’s Chili Bean for $1.00 each. Plus earn gas reward points with the purchase of $25 or more. Combine a coupon insert with this deal to make the final price ONLY $0.38 each. Note: There is a $25 purchase requirement for gas rewards deals.